Happy Meal and I had spent the better part of the day at the California Science Center, and we were both pretty darn hungry. I had spotted Caveman Kitchen with its sign promising "fine burgers" on Vermont Street on the way to the center, and I talked Happy Meal into trying it out. Parking in the little strip mall was free, and we walked into a nearly empty, but spotless, restaurant. We ordered a couple of 1/4 pound burgers, fries, chili cheese fries, and two drinks--that set us back 14 bucks. Our burgers and fries arrived in just under 10 minutes. The Beef: This was tender, moist, nearly creamy Chuck. 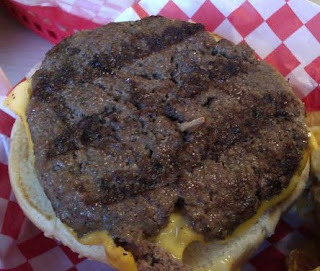 I saw the bright red patties as they slapped them on the grill, and I noticed that they were peppered with bits of fat. This rendered as the beef cooked--while the burgers were a little on the greasy side, they were very beefy in flavor. There was no trace of aging in our cheeseburgers. 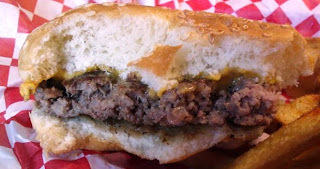 The Seasoning: Caveman Kitchen used a savory spice blend on the exterior of the burgers and did not season the ground beef prior to forming it into patties. This was fine, since the patties were quite thin. The Sear: This was very weak--no sear....no char from the diminutive gas grill. This would have required that they use the griddle, but that may have left way to much fat on the burger. I was grateful to see a small inferno raging around my burger as it cooked. This was less fat for me to injest. The Preparation: The beef was ground to medium and cooked to a juicy Well-Done. The patties were formed by a gentle hand, which did not overwork the beef into a rubbery mess. Well-Done was the only way to go with a blend with such a high fat content. The Cheese: This was standard American, and the cook slapped it on the griddle for a brief moment before applying it to the cooked patties--this caused the cheese to melt perfectly. 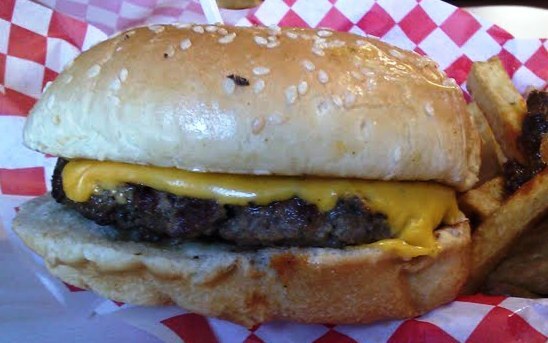 I am a huge fan of American cheese on a burger. The Bun: This was the same sort of squishy, yeasty, seeded, moist bun that I have come to expect and appreciate from Five Guys Burgers and Fries. The bun looked a little big for my 1/4 pound patty, but it compressed perfectly, and it did not interfere with the flavors or textures of the beef and cheese. 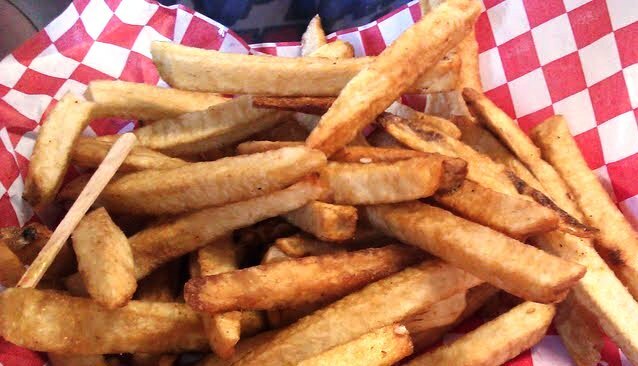 The Fries: These were thick-cut fries, and they were just fine. They were crisp and golden. My chili cheese fries were fantastic. Creamy, gooey, savory, and decadent. The Value: For the price of a single pretty darn good burger at The Lazy Ox Canteen, we got 2 pretty darn good cheeseburgers, 2 beverages, and 2 orders of fries at Caveman Kitchen. Caveman Kitchen served up more juicy, artery clogging chow than I could pack away--I took half of it home. The cheeseburgers were above average and at a darn good price. Win. Burger Review : Caveman Kitchen deserves your business.